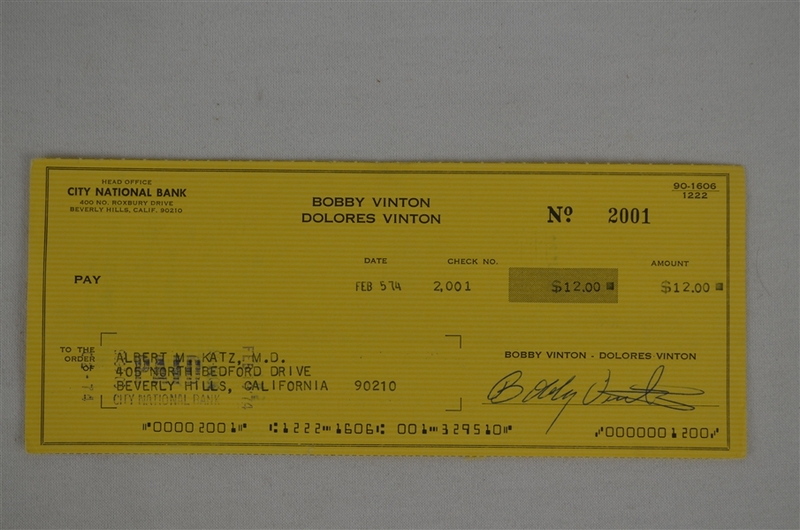 This lot features a check dated February 5th, 1974 and signed by singer/songwriter Bobby Vinton. In pop music circles, he became known as "The Polish Prince of Poch", as his music pays tribute to his Polish heritage. Known for his angelic vocals in love songs, his most popular song, "Blue Velvet" (a cover of Tony Bennett's 1951 song), peaked at number 1 on the now renamed Billboard Pop Singles Chart, and number 2 in the UK in 1990. It also served as inspiration for the film of the same name.